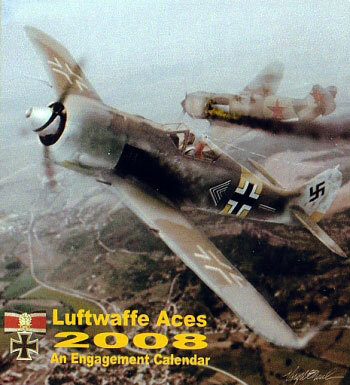 Description and Publisher’s Details: "Luftwaffe Aces 2008 - An Engagement Calendar"; self-published by Virgil O’Neil, email virg@vcn.com . Advantages: Superb colour profiles, excellent composition of the featured artwork, convenient size of publication. Perfectly timed for the New Year is Virgil O’Neil’s release of his 2008 calendar. There are 74 pages which are spirally bound to form a handy desk-top book. Each leaf is devoted to a single week of the year and notable events are mentioned on the appropriate day. The theme is “Luftwaffe Aces” and as such, there are special sheets interspersed throughout. They take the form of lavish illustrations that document the pilot and his aircraft. There are 12 of these, with flyers such as Trübenbach, Krupinski, Schnell and Batz all getting a mention. Naturally the aircraft feature the usual suspects with types such as the Bf 109 series coming under the spotlight. A little more surprising are the three Ta152 H profiles and even a Bf 110 D.
The artwork that makes up this montage is outstanding. Each is accompanied with a photo of the personality concerned as well as images of his rank, awards and unit insignia. A brief history of the plane and the individual is also included with the resulting page being laminated for protection. 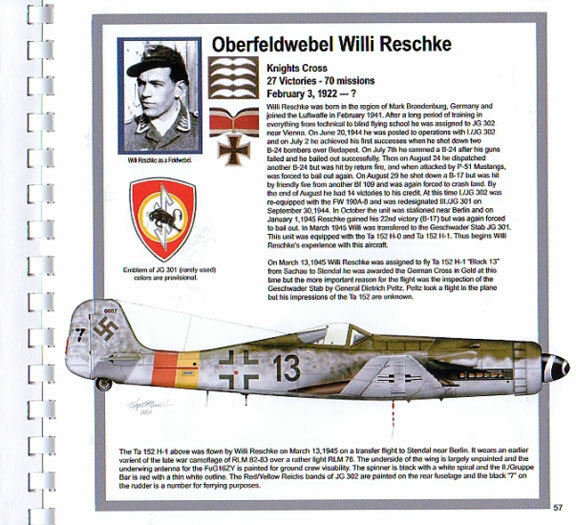 The calendar starts off with a general explanation of the Luftwaffe’s numbering system followed by a clarification of the Knights Cross and its various additions. The book measures 23cm by 21.5cm (9” x 8.5”) which is of sufficient size to be impressed with the artwork and yet still be small enough to grace the work bench. Recommended for all Luftwaffe fans.